July 4th on the 5th: A Record-Breaking Holiday! (July 7, 2014 Edition) Hurricane Arthur (or Hurricane “Author” as the town’s Route 13 sign dubbed him) couldn’t dampen Cape Charles’ July 4th celebration, which from an unofficial count looked to be the largest ever in modern times — certainly judging from the number of occupied parking spaces. Saturday, July 5, proved to be a picture-perfect day for a belated 4th, and residents and tourists made the most of it. 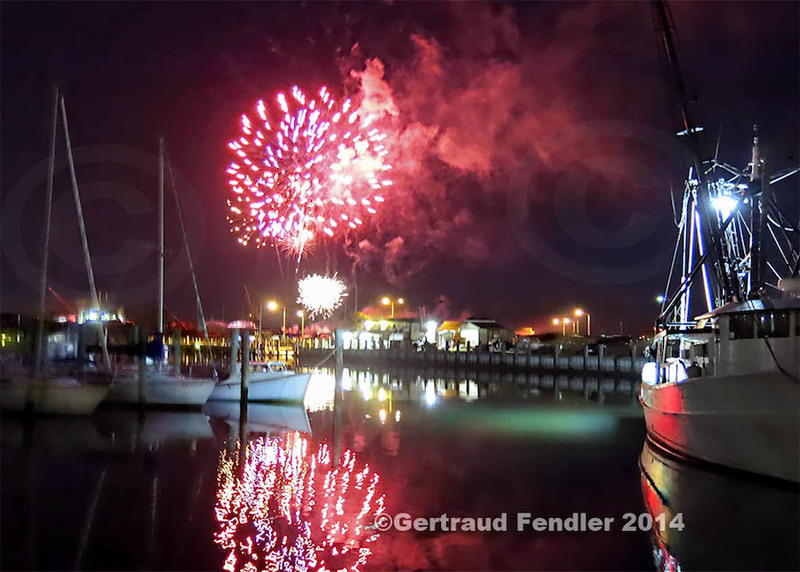 Eastern Shore artist Gertraud Fendler captured the best photo of the Town Harbor we have EVER seen, thanks to the fireworks-illuminated sky. Ms. Fendler has graciously shared a proof photo for Wave readers, while prints suitable for framing (without the copyright signs) are available at the new Ellen Moore Gallery, 223 Mason Avenue.